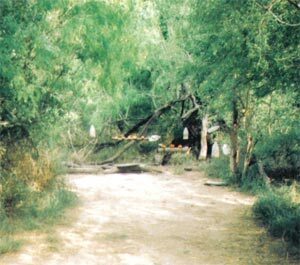 Today (April 11) we aimed to visit Bentsen-Rio Grande State Park and Anzalduas Country Park. We started early at Bentsen with two Couch's Kingbirds and a male Altamira Oriole in the carpark. We were waiting for the park to open and so we restricted to hanging around the carpark for a few minutes. Other birds seen here included White-winged Dove, American Kestrel, two Sharp-shinned Hawks, 20+ Broad-winged Hawks, two Swainson's Hawks and two Great Kiskadees. Next we headed into the park and walked a few of the roads and paths. The 'snowbirds' (birders who stay in the park in winter and set up feeder stations) were mostly gone but a couple of feeding stations were active but quiet. We did get Indigo Buntings at some feeders. Overhead we added Cooper's Hawk, Cedar Waxwing and Chimney Swift. Helen found a singing Long-tailed Thrasher in a roadside tree showing well. Plain Chachalacas could be heard everywhere. A target bird was Northern Beardless-tyrranulet. I found a small flycatcher in a tree about 30 metres away which soon flew closer and turned out to be the target bird. Plain Chachalacas were also seen again as were Green Jay, Golden-fronted Woodpecker, Inca Dove, White-tipped Dove and Tufted Titmouse. At about midday (very hot!) we stood in an openish area of tarmac scanning the skies for raptors. Northern Beardless-tyrranulet was heard and Couch's Kingbird and Golden-fronted Woodpecker seen. An Osprey flew overhead as did a Northern Harrier. Then I happened to look in a direction I hadn't been paying much attention to and saw a slow-flapping bird coming towards us following the road. I thought it looked peculiar then two or three of us shouted together 'Hook-billed Kite'. The bird found a thermal and circled above us gradually gaining height until it was almost invisible. After this success we headed for Anzalduas Country Park. This area can be very popular with the locals and is best visited early. 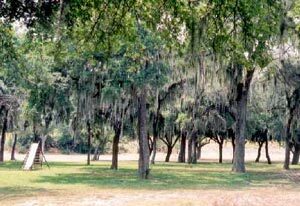 The trees are almost festooned with Spanish Moss. Vaughan's excellent local information meant our first bird was a Gray Hawk on the nest. The bird looked very hot and sat with its beak open. 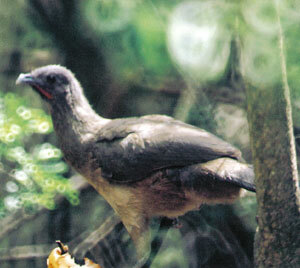 Occasionally, we could hear its mate calling from the woods. We had hoped to see Tropical Parula and Clay-colored Robin here. Unfortunately, this year, there were no reports of Tropical Parula at any regular site. We did have hope for the Robin though. We spread out into the park, covering a large area, most of which is grass under trees. The automatic watering systems were in action often catching the unwary. We did not catch up with the Clay-colored Robin (apparently a pair was nesting in the park) but we did see two Cedar Waxwings, one Black-bellied Whistling-duck, Couch's Kingbird, Great Kiskadee, Plain Chachalaca, Great-tailed Grackle, Tufted Titmouse, Brown-crested Flycatcher, Golden-fronted Woodpecker, Scissor-tailed Flycatcher and an Osprey. Next stop was McAllen Sewage Ponds. Because it had been a very dry winter and spring most of the pools were dry and birdless. However, the trip was still worth the effort in the hot afternoon sun. Telegraph posts held Harris's Hawks and a Swainsons's Hawk flew over. A stop by a dry field alongside a small stream yielded Mourning Dove and our first Common Ground-doves (four in all), plus a Great Blue Heron, a Snowy Egret, one Gull-billed Tern and a female Northern Harrier. We did manage to find one area of water on the banks of which we had 11 Killdeer, 33 Black-necked Stilts, and two Lesser Yellowlegs. A short stop back at the motel, and a bit later around an upmarket bit of McAllen we found two, then four, Green Parakeets. We ended the day back at Bentsen for the specialities. The usual species were seen or heard: Golden-fronted Woodpecker, Ladder-backed Woodpecker, White-winged Dove, Plain Chachalaca, Great Kiskadee, Long-billed Thrasher plus Northern Beardless-tyrranulet. Nearby, whilst crowding round a feeder site we managed to get brief views of Olive Sparrow - more heard than seen. Near the Elf Owl tree, waiting for an appearance, we had Sharp-shinned and Cooper's Hawks, Lesser Nighthawk and White-tailed Kite. The Elf Owl stuck it's head up and almost out a couple of times, enough for all to clearly see the face pattern. Then it was fast drive along a short bit of road to a box proported to hold an Eastern Screech-owl. Just as we arrived, in almost total darkness, the bird flew from the box. We really only saw a silhouette. Finally came the obligatory night-time drive/crawl around the roads of Bentsen hoping for Common Pauraque. A couple of flashes of something were seen but nothing (from my view) definite. The other people doing the same crawl had the same lack of success. We decided to come back for another go next day. Next day, April 12th we started the day again at Anzalduas Country Park, still hoping for the Clay-colored Robins. The usual birds were again seen, including the nesting Gray Hawk. We again spread out over a great area searching for these elusive thrushes and were greatly excited when we heard whistles blowing to call us over to a treeless part of the park. Everyone congregated around three or four people to find out what had been seen. It wasn't the Robin but it was a lifer for most of us in the form of five American Pipits. This species winters in Texas but is usually gone by early April so we were lucky, and pleased, to see them. After visiting Santa Ana we went back to Bentsen that evening for another 'Pauraque-crawl'. First we revisited the screech-owl box and the bird showed well, peering out of the box without being concerned about our presence. With Common Pauraques calling in the distance it felt very tropical. I happened to look up towards the top of the tree that held the box and noticed something sitting there. I tried to quietly tell everyone that there was an owl on the – a light shone it is showed it to be an Elf Owl! This bird showed fantastically well – so much better than a view of a bird just peering from a nest hole – we even heard it calling. We then had another unsuccessful but very enjoyable drive around Bentsen and headed back to the motel.